Do your dog’s nails click when he walks into the room? Do his nails snag on carpeting or scratch you when he jumps into your lap? Keeping your dog’s nails trimmed short isn’t simply a matter of reducing noise and preventing scratches and snags – it’s important for his health. If your dog’s nails grow too long, they can actually start growing under his feet and into his pads. Long-term excessive nail growth can even force your dog to alter his gait which may put him at risk for arthritis later in life. If you want to keep your dog’s nails trimmed but you’re nervous about using clippers, there is another option to consider – a dog nail grinder. Dog nail grinders allow you to shape the nail and to take off one layer at a time. If you’re looking for a versatile solution for trimming your dog’s nails, look no further than this Petcute Rechargeable Electric Dog Nail Grinder. This nail grinder offers two different grinding speeds as well as three different sized ports to accommodate pets of all sizes. You can also remove the cover entirely, if you so choose. The two speeds offered are 6,000 RPM for trimming and 6,800 for speed. The Petcute Rechargeable Electric Dog Nail Grinder features a lightweight and compact design. Not only is it easy to use, but the motor runs quietly so as not to frighten your dog. It is equipped with a lithium battery that charges in an hour and comes with a USB cord. Best of all, this nail grinder is affordably priced under $20. Why go with a plain dog nail grinder when you can have the FurryFido Nail Grinder Kit. This kit comes with the lightweight and compact FurryFido nail grinder as well as six interchangeable grinding heads. This nail grinder is perfect for pets of all sizes, including puppies and small dogs. It offers numerous grinding speeds as well, so you can remove as much or as little of your dog’s nail as you like. The FurryFido Nail Grinder Kit is powered by two AA batteries which are easy to replace. The motor features unique mute technology which ensures quiet operation and it all comes packed in a convenient storage kit. Simply put, this grinder is perfect for trimming, shaping, and smoothing your dog’s nails and it comes at an affordable price. If you’re in the market for a portable dog nail grinder with a rechargeable battery, consider the Greensen Electric Nail Grinder. This nail grinder features a 3.5V motor which is more powerful than many on the market but still runs very quietly. It also produces less vibration than other options which is perfect for skittish dogs. You can’t eliminate vibration entirely with a grinding tool, but this product comes fairly close. The Greensen Electric Nail Grinder features two grinding speeds up to 6,500 RPM which is perfect for thicker nails, but not too powerful for smaller dogs. This nail grinder is rechargeable by USB for your convenience, and it can run for a full 6 hours. This grinder has a safety guard with three ports of different sizes, or you can use it without the safety guard at all. Designed for portability, the URPower Rechargeable Pet Nail Grinder is lightweight and easy to use. This nail grinder features an easy on/off switch and the rechargeable battery can be plugged in using USB. This nail grinder runs for 3 hours on a full charge and the motor runs quietly so you don’t have to worry about scaring your dog. It may still take some dogs time to get used to having their nails ground, but most dogs adjust fairly well. The URPower Rechargeable Pet Nail Grinder is compact and portable. It is perfect for small and medium-sized dogs, featuring a safety guard over the trimming port that is adjustable for different sizes. This grinder features a diamond bit grinder which is safe and effective for pets, plus it lasts forever so you don’t have to buy replacement bits. For a small, lightweight, and portable solution to keeping your dog’s nails trimmed, try the Hertzko Electric Pet Nail Grinder. This grinder features a simple on/off switch and a basic design that is easy to use. It is also rechargeable with the included USB power cord. This nail grinder offers a safety guard with three different openings to accommodate dogs of all breeds and sizes, or you can remove the cover to expose the entire sanding bit. The Hertzko Electric Pet Nail Grinder features a super mute motor that runs quietly, so you won’t stress your dog out. Plus, it is highly portable and comes with a cap to protect the grinding head when the unit is not being used. Overall, it’s a simple and affordable solution for dog nail grinding. While some dog nail grinders are large and unwieldy, the Andis EasyClip 2-Speed Dog Nail Grinder is lightweight, compact, and powerful. This dog nail grinder offers an easy, stress-free way to trim your dog’s nails with a lower risk of cutting the quick. It features an ergonomic silicone sleeve for comfort and it is lightweight and easy to wield. This is an important feature to consider when you’re grinding the nails on all four of your dog’s paws. The Andis EasyClip 2-Speed Dog Nail Grinder comes in a kit with everything you could possibly need. In addition to the storage bag, this grinder comes with three large and two small replacement grinding bands, a polishing head, a wrench, a safety guard, and the power supply. Simply put, if you’re looking for a dog nail grinder that comes with everything you need, this is it. If you’re looking for a grinder designed specifically for pet nails, consider the ConAir Pro Pet Products Dog Nail Grinder. This grinder is lightweight and compact for easy use, and the cord is extra-long for your convenience. The grinder features a simple on-off switch and the sides are ridged to ensure a secure grip during grinding. The ConAir Pro Pet Products Dog Nail Grinder is ideal for dogs of all breeds and sizes, though it does only offer one grinding speed. As a bonus, however, it features a quiet-running motor and it has an adjustable protective cover. The sanding/stone attachments are easy to replace, and the entire unit is designed for efficiency and performance. The Furminator Professional Nail Grinder is brought to you by one of the top dog grooming supply companies out there, so you know it’s good. This nail grinder offers excellent performance in a lightweight package. It helps to ensure that your dog’s nails stay trimmed without the risk of cutting the quick because it comes with an automatic safety guard. You’ll also love that it is affordably priced. This nail grinder is compact and cordless which makes it incredibly easy to use. Plus, with two grinding speeds, you can take as little or as much off your dog’s nail as you like. The Furminator Professional Nail Grinder features an LED light for safety as well as an easy-grip handle for security. It comes with two grinding bands and the anti-microbial plastic materials help keep germs and bacteria away. Dog nail grinders are generally recognized as safer than clippers because there is a lower chance of cutting the quick. The risk is still there, however, which is what makes the Oster Gentle Paws Premium Nail Grinder so great. This nail grinder features an adjustable safety guard to keep you from trimming too far and it works for breeds of all ages and sizes – you can even use it on cats, rabbits, and other small pets, if you like. The Oster Gentle Paws Premium Nail Grinder features a cordless design that is comfortable to use. It comes with everything you need to get started as well, including two coarse sanding bands, a fine sanding band, and a coarse stone band. Simply decide how much you want to take off your dog’s nail at once and choose the appropriate band. You’ll also love that this nail grinder catches the shavings to take all the work out of cleanup. If you’re looking for a top-of-the-line dog nail grinder, consider the Dremel 7300-PT Dog Nail Grinder. Not only is it one of the most popular models on the market, but it offers two different grinding speeds, so you can tackle the toughest nails down to the smallest nails. Simply put, this Dremel 7300-PT Dog Nail Grinder works for dogs of all breeds and all sizes. In addition to featuring two different grinding speeds, the Dremel 7300-PT Dog Nail Grinder features cordless operation to give you ultimate control. Simply recharge the battery when it runs down, and you are good to go. This dog nail grinder comes with six sanding drums as well as a wrench tool to replace the head. All in all, it is a high-quality nail grinder that is easy to use and gets the job done well. Keeping your dog’s nails cut short is important for his health and wellness. Unfortunately, many dog owners neglect this simple task. For some, it is simply because they don’t realize how important it is. For others, it’s because they don’t know how to do the job properly or because they are worried about hurting their dog. If you’re looking for a quick and easy solution to keeping your dog’s nails trimmed, consider buying a dog nail grinder. Keep reading to learn more about dog nail grinders and how to use them. What Are the Advantages of a Dog Nail Grinder? If you have a small, calm dog with light-colored nails, trimming them may be an easy task. When you’re able to hold your dog in one arm, and when his nails are see-through, it is easy to quickly trim his nails without worrying about cutting the quick. But what about large dogs and dogs with dark-colored nails? If you have a hard time keeping your dog still, there’s a higher risk of accidents. Plus, if your dog’s nails are dark in color, you may not be able to see the quick as easily to avoid it. Using a dog nail grinder is a potential solution for both of these problems. When done properly, grinding is virtually painless – your dog may simply be nervous about the vibration and noise of the tool at first. You can shape the nail with a grinder, creating a rounded tip that won’t catch on furniture or bedding. There is a much lower risk that you’ll cut the quick because you’ll see a spot appear on the tip of the nail when you start to get close. It is much easier and safer to grind very large or thick nails than to try clipping them – clipping could result in accidental injury. You can grind a little bit at a time on a more frequent basis to keep your dog’s nails short. When shopping for a dog nail grinder, you want to think about size, durability, and performance. Choose a nail grinder that is appropriate for your dog’s size and look for features like dual speed settings and rechargeable battery. 1. Check your dog’s nails to see if you can see the quick – it is the dark vessel in the middle of the nail that supplies blood (you want to avoid cutting into it or the nail will bleed). 2. Take a look at the length of your dog’s nail and decide how much you need to take of – as a rule of thumb, your dog’s nail should be even with his pad, so remove any that hangs below. 3. Find a comfortable position for your dog – maybe you hold him in your lap or place him on a table (you may need a second set of hands to help restrain him). 4. Turn on the nail grinder and give your dog a few seconds to adjust to the noise – you may even give him a treat or two. 5. Apply the grinder to your dog’s nail at a 45-degree angle below the quick. 6. Grind a little off the nail at a time, checking frequently to see if you’re nearing the quick – when you see a black dot appear in the center of the nail, it’s time to stop. 7. Shape the sides of the nail, if desired, to remove any sharp edges. 8. Repeat the process with the rest of your dog’s nails, using treats to encourage good behavior. Whether you’re grinding or clipping your dog’s nails, you need to keep safety as your number-1 priority. For your dog, make sure you’re only taking off a little at a time. Stop when you see a dark spot appear near the tip of the nail – this means that you’re approaching the quick. For yourself, make sure the grinder is a comfortable size to hold and avoid breathing in the dust it produces as you grind. If you do accidentally trim your dog’s nail too short, it may start to bleed profusely. If this happens, don’t panic! Though the experience can be painful for your dog, it isn’t life-threatening. You do, however, need to get the bleeding under control quickly and the best way to do that is to use cornstarch or styptic powder. If that doesn’t work, apply pressure with a clean bandage for 15 minutes. If the nail is still bleeding, call your veterinarian. 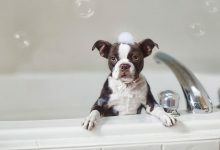 Though using a dog nail grinder is preferable to clippers for many dog owners, there are some things you should keep in mind. First and foremost, know that many dogs are alarmed by the noise and vibration of a dog nail grinder. You may need to take some time to get your dog used to the grinder before you start using it. You can do this b turning it on and off a few times while he’s around and give him some treats, so he starts to form a positive association. When you’re ready to start using the tool, grind one or two nails at a time before taking a break, working your way up to doing all of them in one sitting. Something else to keep in mind is that dog nail grinders produce dust, odor, and heat. The speed and coarseness of your grinder will determine how much dust is produced but you can’t really avoid the odor of grinding your dog’s nails. In terms of heat, make sure you take your time and don’t hold the grinder in any one place for too long. Using a dog nail grinder is something both you and your dog will need to get used to but if you take the time to choose a high-quality model and learn how to use it, it can be an excellent option. Just pick one of our top 10 best dog nail grinders reviewed above and give it a try for yourself!